Neat Motive SX2 review | What Hi-Fi? We’ve got a thing for tiny speakers. It’s partly because they look fantastic, partly because they can be more practical, and we also marvel if they out-perform the big guns. In the case of the Neat Motive SX2s, it’s all of the above. They look great, they save space and they are top performers at the price. Admittedly there’s not much in the way of perceived value with their price, but these tiny titans have plenty going for them. So what do we have here? Cabinets standing 76cm high, leaning back on their plinth – not unlike the Tower of Pisa – and there is also a new tweeter: a 25mm inverted dome made of anodised aluminium (instead of the titanium on older models). Inside, internal bracing and damping have been upgraded since the last generation. There’s also a separate enclosure for the tweeter unit, to minimise crosstalk. Now, to that leaning cabinet, for it’s not just a fashion statement. The idea is that the shorter cabinets need to compensate, and tilting back allows them to fire upwards, towards your ears. There’s a reflex port, but you won’t find it easily. It fires not forwards or backwards, but straight down – venting through the plinth. In theory, this makes positioning a bit more flexible. In practice, we found it suited to place them about 30cm from a rear wall, but standing them in free space didn’t do much harm. Build quality is very high: walnut cabinet and finished to a very professional standard (natural oak, black oak and satin white are also available). When it comes to sound, the SX2s are truly reflective of their smaller stature – in absolute terms, the sound from them is impressive, but not immense. Yet the sound is still big enough ­– and takes us by surprise to an extent. Close your eyes and you wouldn’t be able to tell that the sound was coming from a unit less than one-metre tall. Use the NEATs in a small or medium-sized room and you will be taken aback. The greatest strength of the SX2s is their liveliness. Punchy dynamics and precise timing work together to make the performance very expressive. The sense of enthusiasm is infectious. These speakers want you to have a good time, and it doesn’t take long before we are merrily tapping our feet along to the music. Other models at the price offer more detail and subtlety, not to mention greater scale and deeper bass, but you’ll be having too much fun with the NEATs to care. 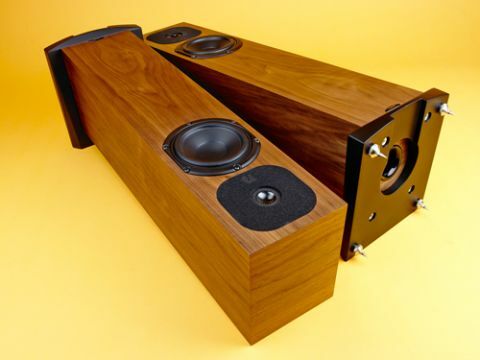 They are hugely entertaining: these speakers won’t blow the roof off, but they will bring a smile to your face. We really like the NEAT Motive SX2s. They are great little speakers that get so much right we don’t mind a few imperfections. Sure, the likes of the B&W 683 S2s shout louder, but put these in a smaller room and they rule supreme.